Many people, including many Archaeologists, believed that there once was a great civilization, and for some unknown reason, disappeared from the face of the Earth. No one knew where they had gone, but the only evidence that great civilization left were massive ruins they left behind, e.g. Chaco Canyon, Mesa Verde, Canyon de Chelly. The term they used for the people or culture of this great civilization was "Anasazi". This mysterious disappearance is what I envision when I hear the term, "Anasazi". We all know now that that the people of that great civilization did not disappear, they just moved. They moved according to the will of the spirits, the sun, the land, the stars, the animals, the weather, and the people. We did not disappear from the face of the Earth. We are still here. The term that those early "Archaeologists" chose to represent that lost culture was, "Anasazi", a Dine' (Navajo) word, that supposedly means, "ancient enemy", "ancient ones", or "enemy ancestor". Dine' are told not to go near ancient ruins because of certain beliefs. The Culture that "Anasazi" refers to are the ancestors of modern Pueblo People of the American Southwest of which I am a proud member of. There are 19 Pueblos in New Mexico, around 13 more in Arizona, and 1 in El Paso, TX. For more click here, Jemez History. The 19 Pueblos in New Mexico speak 5 different languages; Keres, Jemez, Tewa, Tiwa, and Zuni. We each have different names for our ancestors, so recently the term "Ancestral Pueblo" has been used. Although some Dine' and others still prefer to still call them "Anasazi", it is out of respect for modern Pueblo People that most anthropologists and archaeologists now use the term Ancestral Pueblo, or Ancient Pueblo. Many flute makers have begun making this rim-blown, open-ended, 4-to-6 holed flute, which I call Pueblo Flutes and not, Anasazi Flutes, because of the reasons I have stated. They claim that they have "revived" or "rediscovered" a lost and ancient tradition, but what they do not claim is (or they do not know or fail to ask) that these types of flutes are still used. 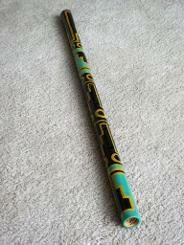 Sure, they also make Hopi Flutes, which the Hopi People still use, but they too are Pueblo Flutes with one less hole. 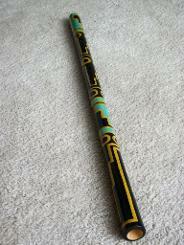 Our own Jemez Pueblo Flute has 4 holes, and we are descendants of the Ancestral Pueblo People, as are the Hopi People. So, I would rather have people call these types of flutes, Pueblo Style Rim-blown Flutes, instead of Anasazi Flutes. Pueblo Bonito Painted Room 33 Flute replica Pueblo Flute.